The hurricane center just put out a special advisory after the hurricane hunter recon visit. They bumped winds up to 65 mph and moved the track farther south. As mentioned in our previous update it looked like an eyewall was just starting to take shape. If this is the case Karl will be a hurricane by this afternoon. karl has progressively strengthened and will likely to continue to do so until landfall late tomorrow. Emergency preparations should be completed as soon as possible on the west side of the bay of campeche. karl will likely be a cat 2 hurricane or possibly a cat 3 at landfall. Heavy rainfall of 5-10" will be seen near the path of Karl. 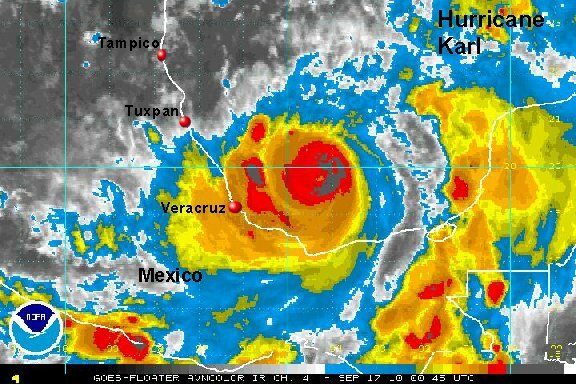 As of 2 pm edt / 1 pm cdt hurricane karl was centered near 19.7° N / 93.3° W or about 280 east southeast of Tuxpan, Mexico. Top sustained winds are estimated at 75 mph (NHC 75 mph 1 pm cdt advisory). Movement is west at 12 mph. Pressure estimated at 983 mb by the hurricane center. The forecast has Karl over Bay of Campeche before until its next landfall south of Tuxpan Friday evening. Karl is a small system with the strongest winds and heavy rain extending out about 50 miles in all directions from the eye. The highest storm surge should be expected near and north of the landfall location. At this time it appears that landfall will be north of Veracruz and south of Tuxpan. Heavy rainfall of 5-10" will be seen near the path of Karl. 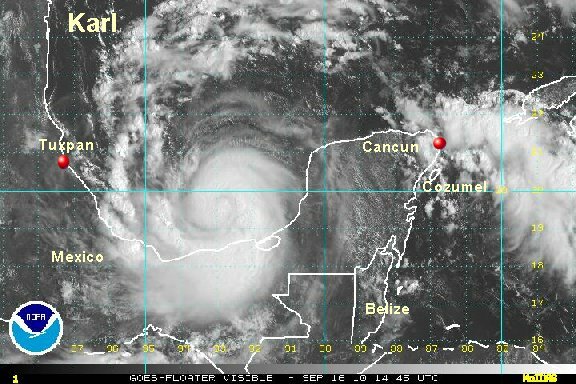 As of 10 pm edt / 9 pm cdt hurricane karl was centered near 19.8° N / 94.5° W or about 115 east northeast of Veracruz, Mexico. Top sustained winds are estimated at 80 mph (NHC 80 mph 7 pm cdt advisory). Movement is west at 12 mph. Pressure at 971 mb by recon. The forecast has Karl over Bay of Campeche before until its next landfall south of Tuxpan and north of Veracruz Friday near noon. Note: the landfall time has been moved up by about 8 hours due to the fact of Karl taking a more southerly course and will arrive over land sooner. Unfortunately, like most hurricanes this season, Karl has undergone rapid deepening. A very well defined eye has appeared and a thick, very cold cold top eyewall has developed. 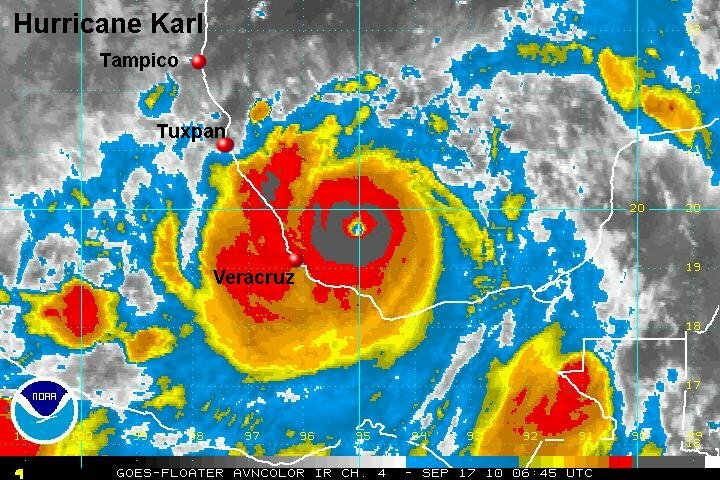 There will be significant damage seen on the mexican coast from karl. As of now, the strongest part of the eyewall is south of the center. That will place it close to Veracruz or just north of Veracruz. Landfall will be north of Veracruz and south of Tuxpan. The eye should make landfall near Laguna Verde nuclear power station. Landfall will occur near or just after noon. Heavy rainfall of 5-10"+ will be seen near the path of Karl. Our strength estimate is due to the fact that the eyewall has cooled since the hurricane center's advisory time a few hours ago. 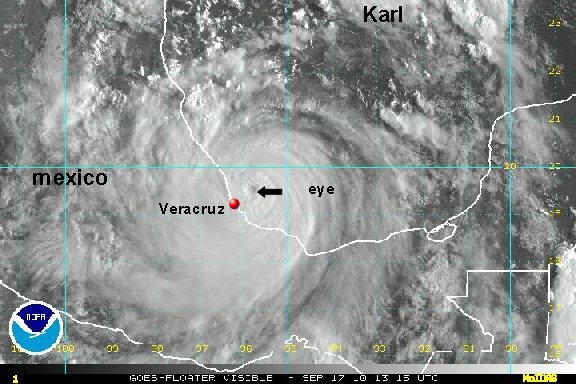 As of 6 am edt / 5 am cdt hurricane karl was centered near 19.7° N / 95.4° W or about 60 miles northeast of Veracruz, Mexico. Top sustained winds are estimated at 130 mph (NHC 120 mph 4 am cdt advisory). Movement is west at 9 mph. Pressure at 961 mb by recon. Interests on the Mexican Bay of Campeche coast should follow the progress of Karl, especially between Tuxpan and Veracruz. With very fortuitous timing, the cloud tops have warmed considerably over the past three hours indicating significant weakening. The eye is not as imposing either. It does appear that Karl has taken a slight turn now to the west southwest which will place the landfall near Veracruz or just a little to the north of Veracruz in the next couple of hours. It is likely that Karl will now continue to weaken just before landfall and thereafter. If looks like prayers have been answered. I would have been a lot worse if karl made landfall as strong as it was only six hours ago. Heavy rainfall of 5-10"+ will be seen near the path of Karl. 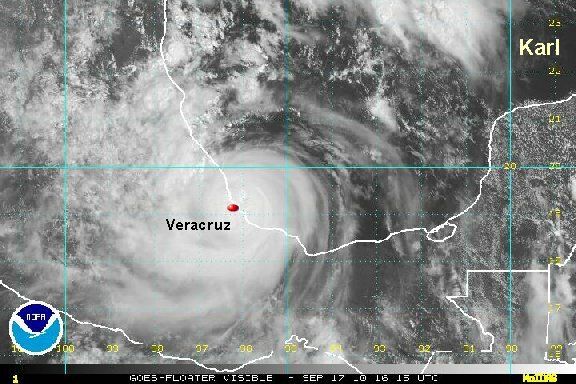 As of 10 am edt / 9 am cdt hurricane karl was centered near 19.5° N / 96.0° W or about 25 miles northeast of Veracruz, Mexico. Top sustained winds are estimated at 105 mph (NHC 120 mph 7 am cdt advisory). Movement is west southwest at 9 mph. Pressure at 956 mb by recon. The hurricane center based their strength estimate of 120 mph from a 700 mb wind that a recon found. That measurement showed a 700 mb wind of 118 knots or 136 mph. The same recon gave an estimate of 95 mph surface wind. It is very interesting to note that Veracruz has only measured winds sustained at 46 mph with unknown stronger gusts. Something is not adding up since the eyewall was very close to Veracruz. It's possible that the strongest winds were barely farther north, but we doubt that sustained winds of 120 mph with gusts to 135 are going to be seen. The pressure of 967 mb doesn't support close to a wind of 120 mph either. We are estimating rainfall of 5-10" will be seen near the path of Karl. As of 1 pm edt / 12 pm cdt hurricane karl was centered near Veracruz, Mexico. Top sustained winds are estimated at 95 mph (NHC 120 mph 10 am cdt advisory). Movement is west southwest at 9 mph. Pressure at 967 mb by recon. This will be our last update on Karl since it has made landfall. karl will weaken rapidly and spread heavy rain with flash flooding inland.